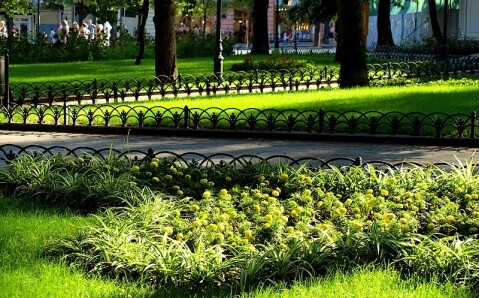 Adjacent to the well-known Deribasovskaya Street, the City Garden is the most famous park in Odesa. Founded along with the city itself, it is the oldest green zone in the Southern Palmira. 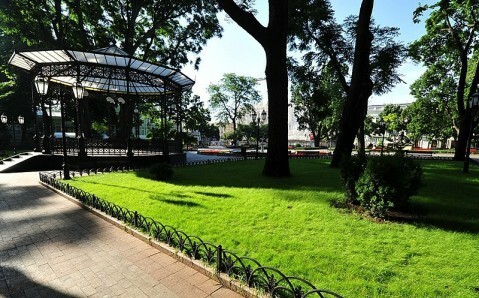 As of today, the 200-years-old park, located in the very center of the city, continues being one of the most popular attractions among tourists and locals, which name it the heart of their city. The garden was founded in 1803 when Felix, brother of one of the Odesa founders and its first mayor, José de Ribas, obtained a land lot and decided to construct a house. The unused five acres of land were planted with trees. 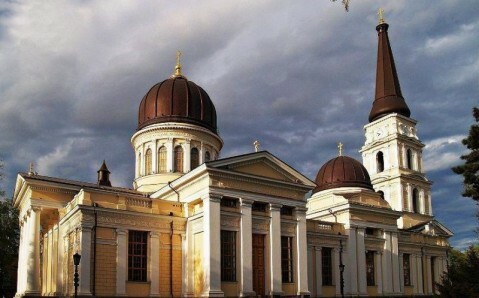 He ordered saplings and seeds in Italy and Spain; some of them were brought from Sofievka Park, Uman. The acacia and wild chestnuts were bedded out first here; as of today many of them still grow in the park. Slowly, the garden extended, and it turned out to be very difficult to keep it. Also, gardeners’ service and building of spraying infrastructures required a lot of money. As a result, the lack of money made Felix de Ribas decide on donating the park to the municipal authorities in 1806. Since then, the garden with rosy flowerbeds, fountains, alcoves and benches became very popular among locals, especially among Odesa elites. One might have a rest in charming greenery, as well as learn latest city’s news, drink curative water in the alcove of mineral waters and listen to the brass band. Besides vivid flowerbeds and age-old trees, the City Garden features a lot of sights that rose to be the visit cards of Odesa. In particular, the park houses several original sculptures and monuments. 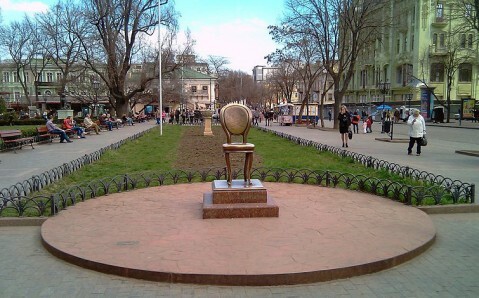 Perhaps, the most famous composition is “Lion and lioness”, which adorns park from the side of Deribasovskaya Street. 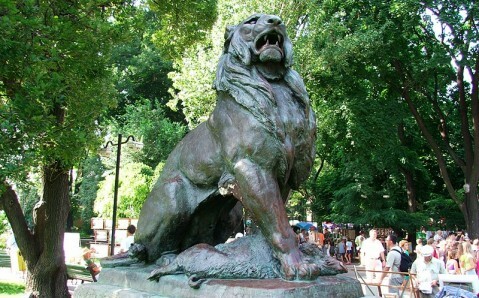 The copper figures of lion and lioness were made by French sculpture in the middle of 19th century and transported to Odesa for one of the well-to-do citizens. 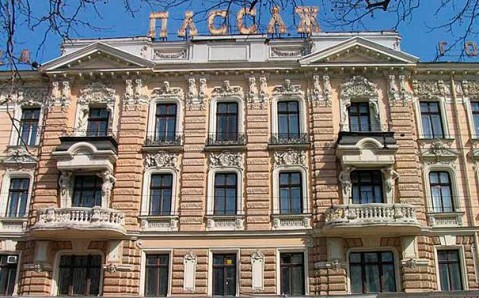 He used them to flank the entrance to his mansion located on Frantsuzky Boulevard. The lions were moved to the City Garden in 1927; they guard it till now. 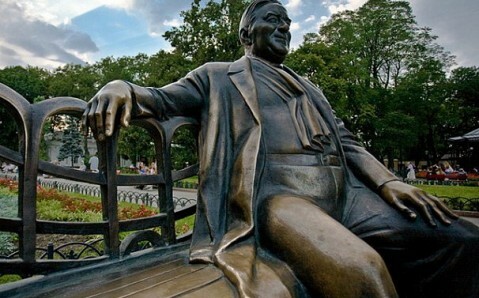 Other highlights of the park are monument to the Twelfth chair, the protagonist of Ilf and Petrov’s famous novel “The Twelve Chairs”, and a bronze statue of a legendary Odesa-born singer, Leonid Utyosov. Another attraction of the City Garden is a bronze Love Tree that features heart-shaped leaves, and its trunk numbers inscription of word “love” in 65 languages. One more well-loved attraction of locals and guests alike is the unique fountain of Carrara marble that represents intricate combination of old times (it was constructed 200 years ago!) and modern technologies. It gladdens the City Garden’s visitor with light and sound shows every night. The park also features expositions of local artists, dozens of eateries, bars, restaurants that serves international dishes, including Odesa-inspired one. Есть бессовесные родители которые курят около своих детей! И вредят детям окружающим. Отсюда прекрасный вид на отстроенную гостиницу! Посидеть у Утесова на руках! Вечером фотографируемся с живыми скульптурами. Тариф - 10грн. Сюда еще небольшую детскую площадку, чтобы все хорошо стало. Бесплатный вайфай от Цитрус-скамейка и открытой сети wifi.in.ua. После подключения зайдите в браузер, чтобы активировать его. Я люблю это место больше всего в Одессе. 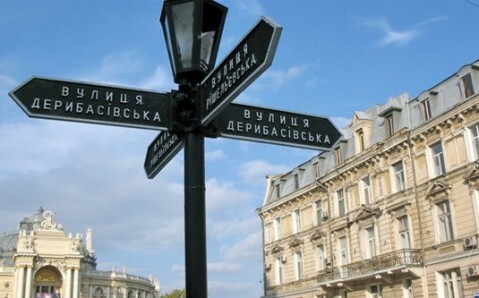 Classic tourist attractions of a City Garden: "12th Chair", Utyosov monument, summer terrace of the "KlaraBara" restaurant, Singing Fountain, Saturday dancing at Rotonda, beerhouse "Beer Garden"
Here you can find the most expensive apartment of Odessa (above "Jardin" restaurant). The house is under UNESCO protection. Actually, the restaurant is amazing too ("Tripadvisor" no1)! 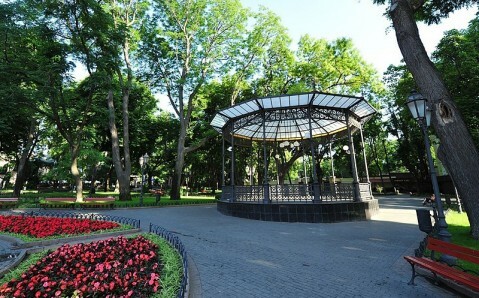 City Garden (Городской Сад) is the first garden in Odessa (1806). It was a private garden of Felix Deribas who presented it to the city and therefore made it public. Очень красиво уютно и удобно! Хорошее место для встреч и общения. Красиво тут) вкусное сырное печенье продают на улице, от заведения Кларабара. Дебильнейшая система полива, включаясь ЗАЧЕМ-ТО вечером, мочит все скамейки. И людей. Есть, где посидеть, познакомиться с туристами, встретить знакомых и друзей. Особенно люблю заходить в магазинчик в пассаже, где очень много вещей для рукоделия. Красота! Мэр Гурвиц навел здесь красоту! Чарівне місце для відпочинку у самому серці Одеси! здесь невероятно мило и днем,и вечером.особенно,когда немного людей!